A few weeks back a friend asked me if you can freeze cooked eggs. Even though cooking eggs usually doesn’t take too long, there are those mornings when you are running a bit late but you don’t want to scrimp on breakfast. I told her I’d do some experimenting (and a bit of research), which led to these breakfast burritos. From everything I read online it seemed that cooking and freezing eggs was easy, with a few simple tips. First, undercook the eggs a bit as they will cook more on reheating. Second, let any make ahead burrito contents cool before rolling to ensure the tortilla stays together. Finally, choose mix-ins that freeze well (tomatoes, for example, would not have a great texture on reheating). For my experimentation I first tried just scrambled eggs (two) with cheese. To reheat it took only about 1-1.5 minutes to warm them up from completely frozen, and they tasted great. I was now ready to venture into Make Ahead Breakfast Burritos. 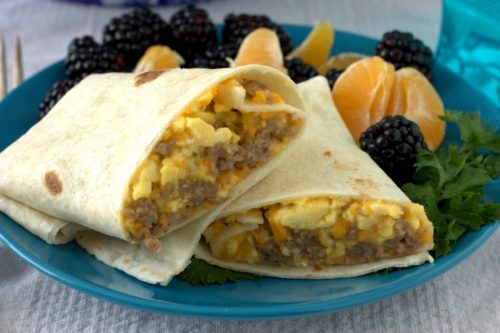 I typically eat a lighter breakfast, but there are definitely days I enjoy the treat of eggs or a breakfast burrito. 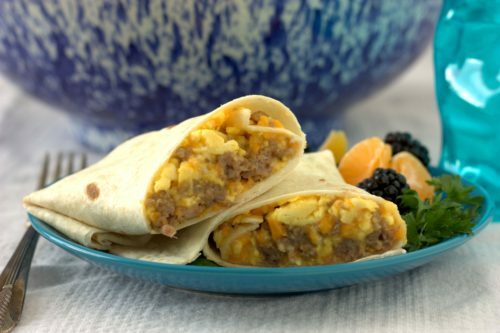 For these burritos I added cheddar cheese and precooked pork sausage, which is a combo I have always enjoyed in breakfast casseroles. The meat and eggs cooked up fast and the burrito rolling was easy once I watch a tutorial to make sure I was doing it correctly. Then came the fun part – freezing and reheating for breakfast to determine the correct thaw time. 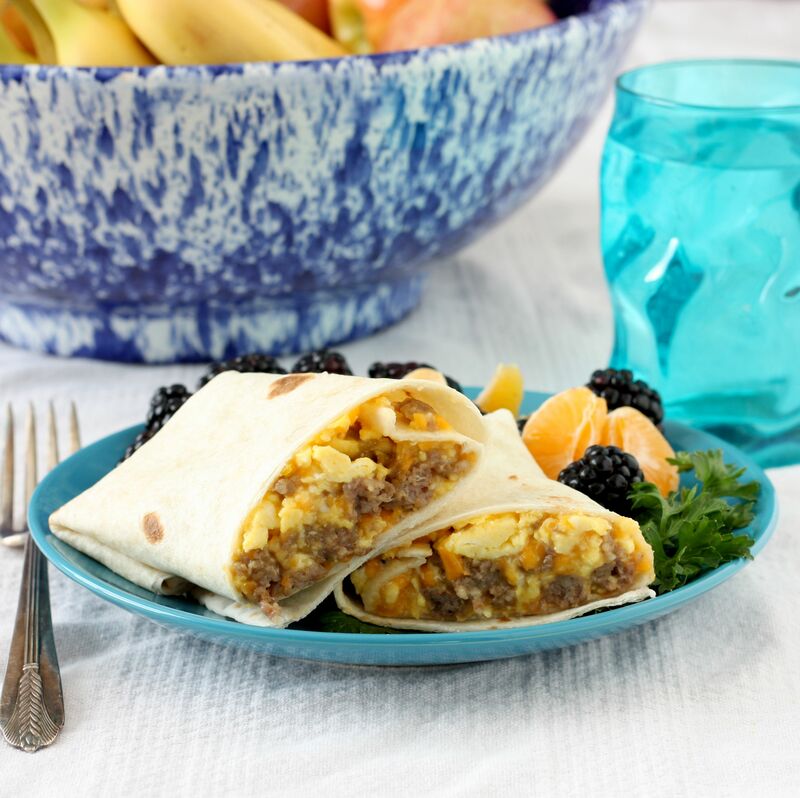 These burritos can be reheated from frozen and only take 2 minutes. I found this time ensured that the entire burrito was thawed throughout, but did require a minute or so to cool a bit before eating. Now that I know having a quick and healthy breakfast on hand is so easy, I think I will always keep a stock in my freezer. I love food challenges posed by friends! beat and pour eggs into a large pan that has been coated with a bit of nonstick spray. Scramble the eggs for 4-5 minutes or until barely set; stir in cheese. Let cool, then stir in breakfast sausage. Evenly divide the egg mixture between the burrito tortillas, placing slightly over to one side. Roll one side over the filling until the filling is covered, then fold in the left and right side and then continue to roll to the end. Wrap in a sheet of foil and continue with remaining burritos. Place the burritos in a gallon sized freezer bag and freeze until ready to eat. To reheat, remove the foil and then microwave each burrito for 2 minutes on high, flipping once. Let cool slightly before eating. (Note: 1.5 minutes left the burritos still a bit cold in the center). This entry was posted in Breakfast, Food Science and tagged cheese, eggs, experiment.